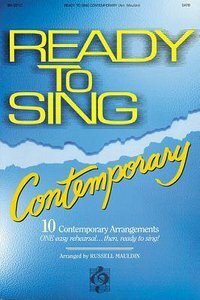 The "one-rehearsal" singability of the Ready to Sing Series is combined with some of today's most popular inspirational songs to give you Ready to Sing Contemporary. Ten contemporary standards are now available in easy SATB for the small to medium choir, or for the larger choir with "last-minute" performance needs. Songs include: Chorus Medley: Our God Reigns - Awesome God * Cornerstone * He's Been Faithful * How Beautiful * I Bowed on My Knees and Cried Holy * In Christ Alone * More Than Wonderful * People Need the Lord * Thank You * Thy Word. About "Ready to Sing Contemporary Volume 1"